The worst is yet to come for the frustrated crew onboard Groupama 4, as the windless ridge stretches further across their chosen route to the finish in Cape Town and the crew play games to keep themselves amused. Despite the obvious frustrations, multihull sailing champion and Groupama sailing team skipper Franck Cammas was able to remain philosophical about this team’s position, especially as third in Leg 1 and overall was all but guaranteed. “Third is not that bad, some others are in a much worst situation,’’ he said. “But we are disappointed because, especially at the end of the leg, we didn’t get to come back on the others. Volvo Ocean Race meteorologist Gonzalo Infante said Groupama would continue to encounter fickle, light upwind conditions until later this eventing, possibly for another 10 hours. Their saviour will be a low-pressure system that will build increasing southern winds overnight. The southerly change means Groupama will be able to gybe later tonight, and finally point and accelerate for the finish at Cape Town. 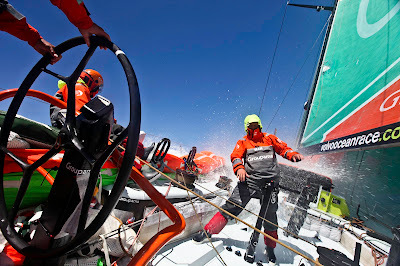 However, closer to South Africa’s shores awaits a hostile greeting similar to that afforded to CAMPER with Emirates Team New Zealand, Infante said, with winds gusting in excess of 30 knots and confused seas from at least 50nm from the finish line. Cammas said his team were in no rush, and keeping the boat and her crew safe and in one piece was priority number one. "We want to get to Cape Town as soon as possible because the stopover will be short, but we also want to get there in one piece with a boat in perfect condition. "It’s a combination of both going fast without taking useless risks"
While the unpredictable conditions make any estimated finish time more of a guestimate, Infante said a finish could be expected tomorrow morning, possibly 0900 UTC. Groupama will take third place on the leaderboard with 22 points assuming they get across the line. Team Telefónica lead with 31 points, followed by CAMPER with 29. As Cammas alluded to, some teams are in a far trickier situation than Groupama. PUMA Ocean Racing powered by BERG were playing golf on the remote island of Tristan da Cunha as they awaited a ship that finally left Cape Town in the early hours of Monday. The best Ken Read’s team can hope for is to be back in South Africa on December 6 – just four days before the second in-port race. Abu Dhabi Ocean Racing and Team Sanya, forced to retire form Leg 1, were expecting their boats to arrive in Cape Town by Wednesday.